The standard power adapter for Apple laptops is a work of art. The Magsafe connector has saved more than one laptop owned by the Hackaday crew, and the power brick with interchangeable plugs for different countries is a work of genius. Being a miracle of modern manufacturing doesn’t mean Apple gets it right all the time; the UK adapter doesn’t use the ground plug, leading to the power supplies singing at 50 Hz when plugged in. [Gareth] had had enough of the poor design of his charger and decided to fix it. The Apple power adapter has two obvious connections, and another shiny metal disk meant for a connection to Earth. In most of the Apple charger ‘extension cords’, this earth connection is provided by the cord. In the smaller plug adapters – even ones where space is not an issue, like the UK plug – this connection is absent. To fix this glaring oversight, [Gareth] shoved some aluminum foil where the earth terminal on the plug should go. A hole was drilled through the plug to connect this foil to the Earth socket terminal, and everything was covered up with kneadable epoxy. No, aluminum foil probably won’t do its actual job of preventing horribleness in the event of an insulation failure or short. It will, however, silence the 50 cycle hum emanating from the power adapter, and that’s good enough for [Gareth]. [Mike Worth] wanted to use his camera for some time-lapse photography. Since it’s used to take many pictures over a long period of time, he doesn’t want to deal with batteries running low. But there’s no standard power jack on the side; instead the official charger consists of an adapter that is inserted in place of the batteries. Rather than break the bank with the special cable, [Mike] made his own battery compartment A/C adapter. You can see that it is made up of two parts. The first is a standard wall wart that outputs the correct voltage and has an acceptable current rating. 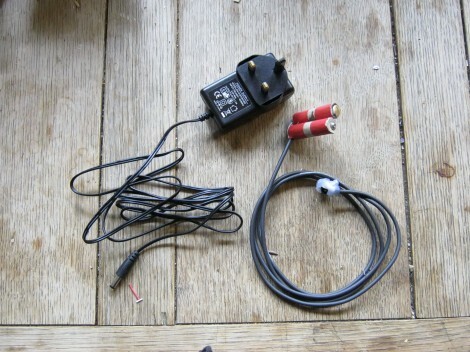 The other part is the adapter cable that connects to the camera on one end, and has a barrel jack on the other. [Mike] rolled some paperboard around a pencil until it matched the diameter of a AA battery. Once of the cylinders has a thumb tack for the negative lead, and the other uses a screw and washer for the positive side. He soldered some wire to these and he’s in business. He must be snapping photos frequently enough to avoid the auto-shutoff feature. That or he’s disabled it with the use of some custom firmware. There’s no question that Apple has their industrial design down pat; comparing a cell phone charger made by Blackberry or Motorola to the tiny 1-inch-cube Apple charger just underscores this fact. [Ken Shirriff] posted a great teardown of the Apple iPhone charger that goes through the hardware that makes this charger so impressive. Like most cell phone chargers and power supplies these days, Apple’s charger is a switching power supply giving it a much better efficiency than a simple ‘transformer, rectifier, regulator’ linear power supply. Inside the charger, mains power is converted to DC, chopped up by a control IC, fed into a flyback transformer and converted into AC, and finally changed back into DC, and finally filtered and sent out through a USB port. The quality of the charger is apparent; there’s really no way this small 1-inch cube could be made any smaller. 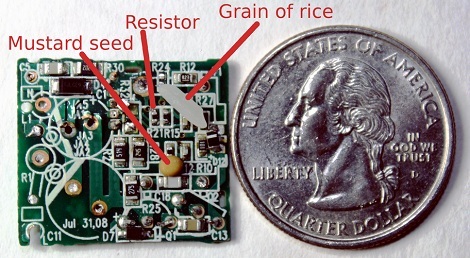 In fact, if it weren’t for the microscopic 0402 SMD components, it’s doubtful this charger could be made at all. Comparing the $30 iPhone charger of a cheap (and fake) iPhone charger, the budget charger still uses a flyback transformer but there are serious compromises of the safety and quality. The fake charger doesn’t use a power supply controller IC and replaces the four bridge diodes for a single diode to rectify the AC; a very efficient cost-cutting measure, but it does lead to a noisier power supply. There’s also the issue of safety; on the Apple charger, there is a (relatively) huge physical separation of ~340 VDC and your phone. With the off-brand charger, these circuits are separated by less than a millimeter – not very safe, and certainly wouldn’t be UL approved. It’s worth pointing out that [Ken] compares a similar $7 Samsung charger favorably to the $30 Apple charger. Both are functionally identical, but Apple also has their marketing down pat, to say the least. Tip ‘o the hat to [George] for sending this in. 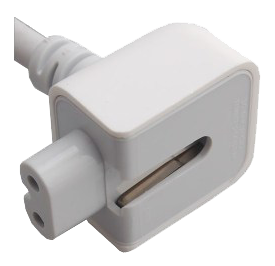 EDIT: In case a 1-inch cube wasn’t impressive enough, check out the euro version of the iPhone/iPad charger. It supplies 1A @ 5V, and isn’t much thicker than the USB port itself. Thanks [Andreas] for bringing this to our attention. If anyone wants to do a teardown of the euro version, send it in on the tip line.